Recent heavy rains and flooding in New England have wrecked havoc on the area and frankly, made us a little crazy. On the umpteenth evening of deluge, our primitive survival instincts took over and drove us to the nearest high ground, which happened to be the end of the C line. 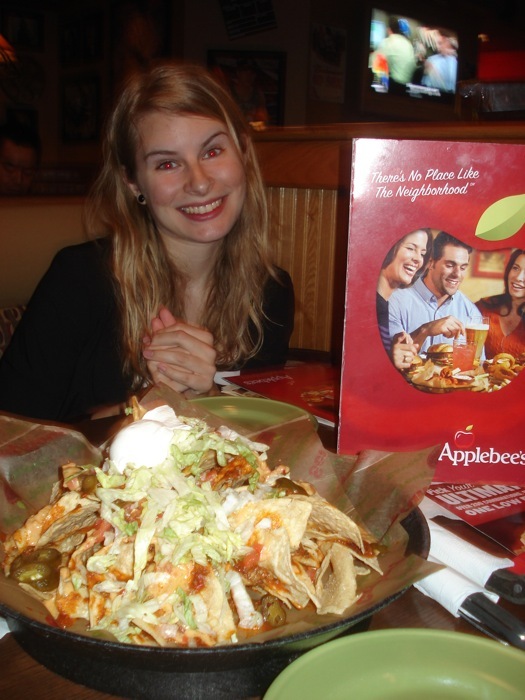 There, remembering the good times we one had eating chain restaurant nachos, we holed up in Applebee’s and awaited the rainpocalypse with their Chili Cheese Nachos. This proved to be fateful error. Were this a zombie movie, we would have died in the 35 minutes, crouched, trembling in a corner of the kitchen clutching a meat cleaver, only to be mauled from behind by the chef, now undead, exiting the walk-in freezer. Fortunately for us, life does not imitate George Romero, and while we left poorer, fatter and grumpier, we made it out alive. ...That gets dashed upon the first bite. Appearance: (5) Salad gone wrong. Quality of Ingredients: (3) The chips were horribly stale, which ruined the whole nacho experience. 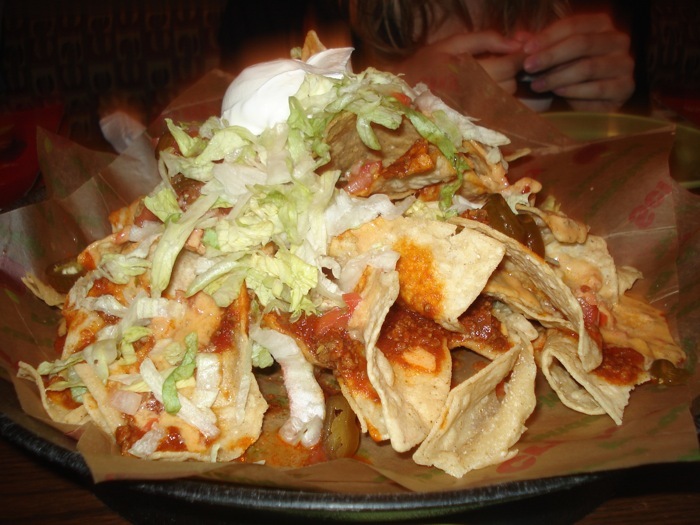 It doesn’t matter how good the toppings are, bad chips sink the ship, and these nachos had nothing helping to keep them afloat. We didn’t realize that the term “chili cheese” was literal– the two ingredients were mixed into a wan, watery concoction that was much less than the sum of its parts. We almost appreciated the sour cream on top, so you KNOW it was bad. Sad lettuce on top just added to the misery. Distribution of Toppings: (6) Cheese sauce adds viscosity, but there were still naked chips. We could have really used some guacamole or some heartier chili, or delivery from Roggies. Price: (6) Sizeable, but regrettable for $8.69. Overall: 20/40. No. Just no. If you needed any more reasons to avoid Applebee’s, they somehow felt that a green olive is the appropriate garnish for their “Perfect Margarita”. Applebee’s, we’re kicking you off the ark. ← James’s Gate: Let Us In! 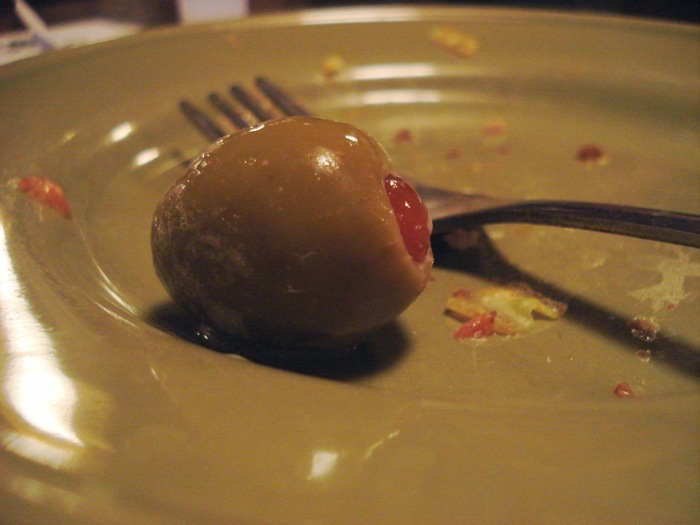 I wouldn’t expect anything else from Crapplebee’s, but the OLIVE with a MARGARITA? !